When you choose a wood lathe, you should first be clear on what you expect out of it. Consider features like the weight of the lathe, power of the motor, bed space, and swing. All these added to the specific set of features that you might have in your mind should help you choose one. The Rikon 70-100 is a great one to consider if you are buying your first lathe. This is a mini-lathe that can give you a great capacity even with its small size. 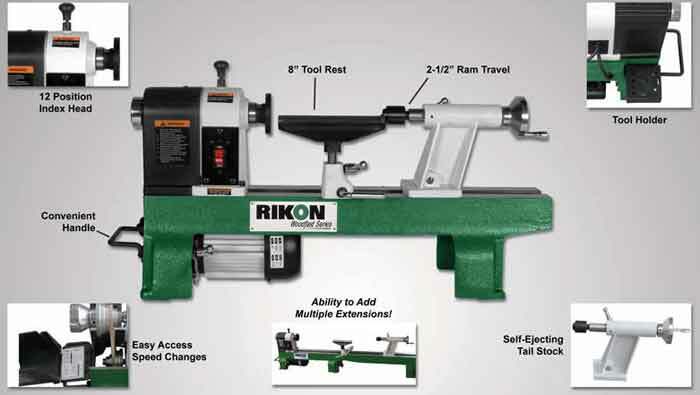 The Rikon 70-100 Mini Lathe features a 6-step motor installed with spindle pulleys to deliver variable spindle speeds. To change the spindle speed, you have to open the access flap and loosen the locking joint. This feature lets you carve out the required design while using the machine. This machine, though small in size, doesn’t compromise on functionality. It allows you to work with much larger objects while occupying much lesser space. With a 12 inches swing and 16 inches between the centers, the Rikon 70-100 Mini Lathe offers ample space to perform the job while consuming minimum space at the same time. Even its close competitor in the mini lathe segment, Grizzly G8688 comes with a mere 7 inches swing and 12 inches distance between centers. Rikon has designed this machine while keeping the user in mind. It comes with easily accessible speed change buttons, which offer enough duration for changing the speeds rapidly. As a result, the speed is quick and the machine is simple to use as well as safe to handle. Nevertheless, several mid-range lathe use lamp dimmers to control the speed, but this however is not the case with the Rikon 70-100 Mini Lathe. For this reason, it delivers maximum power for every speed variant you use. This mini-lathe comes with an easy to use nylon-face plate washer which prevents the used materials getting stocked on the spindle. With an additional flip-up handle, it delivers mobility and can also be used as a tool holder which makes it quite simple to access the centers and the knockout bars. This lathe is easy to use in comparison to its competitors like Shop Fox W1758 which might not be ideal for beginners. The dual purpose lock is situated at the top of the headstock and is quite easy to use due to its location. The indexing meter on the headstock has twelve equally spaced positions. This indexing feature offers an accurate pattern work for several detailed tasks like grooving, straight fluting, layout, drilling and several others. It also enables the user to lock the spindle, remove chucks, faceplates, and other similar accessories without the need of two different tools. Using the spindle lock is quite easy. With it, you can lift it up and rotate it a half turn to detach it from the locking pin. The pin can then be engaged with the closest pin available. Once the locking is done, it is quite easy to disengage the face plate. The Rikon 70-100 Mini Lathe is delivered with different accessories for versatility. It can be easily customized and tailored to meet your needs. For example, you can mount it on a stand and adjust the height as per your convenience. This means you can also use face plates and different rests to meet your requirements. The primary selling feature of the Rikon 70-100 Mini Lathe is its 12-position indexing head, which can be used to lock the workpiece in different positions and can produce intricate details in the workpiece. You can also easily imprint detailed pattern designs on the pieces. The indexing head additionally makes it possible to lock the spindle in one spot for easy removal of chucks, faceplates, and other residual materials. The Rikon 70-100 Mini Lathe doesn’t need a knock-out bar to remove the center piece. You can simply save a lot of time with the self-ejecting tailstock. The ram can travel up to 2-1/3 inches and the tail stock is also movable along the bed. It can be moved by loosening the locking lever and then reclocking it as per convenience. User-friendly, designed with the user in reference. Some segments of the machine are not a perfect fit. The tailstock may be a little weak for some units. If you have just started a workshop or just need another lathe for designing tasks, you don’t have to search hither-tither. The Rikon 70-100 Mini Lathe is meant exactly for you. With this machine, all your wood works would be a joyous experience for the years to come. No matter whether you are a newbie or an expert in the field, this machine is exceptional in all fronts, a fact which has earned it the expression "the perfect apprentice to your every job". With 12 inches over the bed, it delivers ample space so that you can experiment with the pieces and pursue your passion. The Rikon Mini Lathe is small in size and this facilitates economic usage of space with maximum output. This unit delivers versatile performance, is a huge time saver, is easy to use. It is the best mini wood lathe available in the market.